At Oklahoma Shelters we provide Safe Room and Underground Steel Bunkers in Oklahoma and Texas. Our Safe Rooms and Underground Steel Bunkers meet and exceed FEMA guidelines. Each is rated to withstand the force of a F5 Tornado. They are installed above ground and comes with a 36″ foot door. That size makes it wheelchair accessible. The Safe Rooms can be put installed inside or outside. Most of these are installed in the garage and each is custom built. When you place your order we will ask you where you want the door. Where you want the hinges and how you want the door to open. Basically which side you want the handle and hinges. We will also makes cut outs if you would like to put in an extension code so you can have power in it. We still recommend that you have battery operated lights for the Safe Room. When you call us we will help you with your decision. On what size Safe Room will be a good fit for your family. When you place an order for a Safe Room. It typically takes about 7 to 10 days to build and install it. 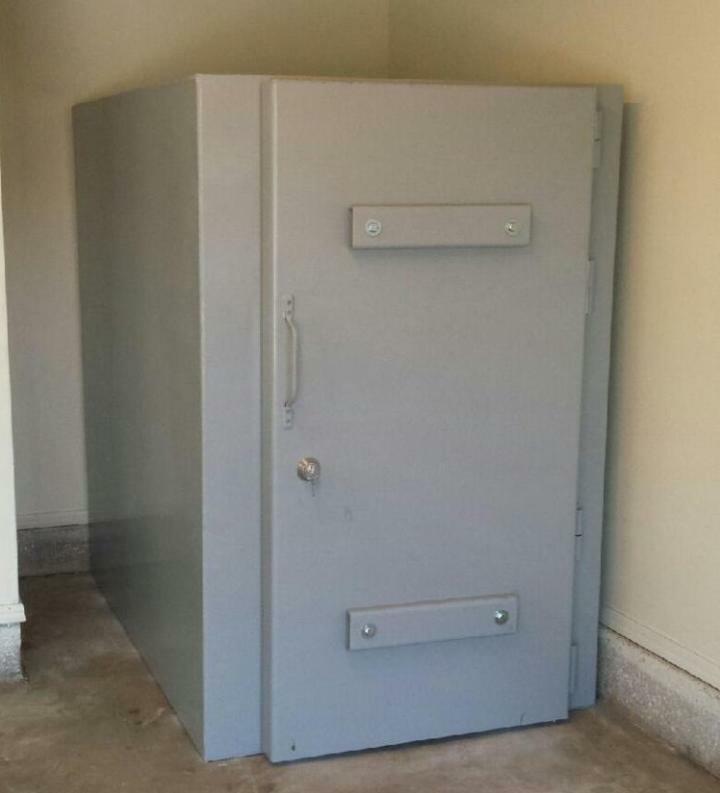 When the Safe Room is delivered it is completely assembled and completely encased in steel. They also come with a Steel Floor. With a Steel Floor when it is mounted to the slap it will give it a better hold. Each bolt is anchored every 12 inches. Each bolt has a sheer strength of 10,000 pounds. A 4×6 Safe Room will have 18 bolts that secure it to the slab. The bolts are anchored into the slab from the steel floor. Our Safe Rooms have passed the Texas Tech Impact test.